Simple, elegant and affordable, sums up today’s half-round gutters from Minnesota Leafless Gutters. The cost for installing durable steel gutters is no longer out of reach for many Minnesota homeowners who want great performance and that distinctive, clean look for their house. Seamless half-round galvanized steel gutters can be engineered right on site by a licensed contractor who can customize the fit and finish as you watch. There are many different enameled colors to choose from to give your home a rich custom look without the big price tag. 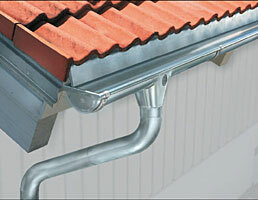 Why Choose Seamless Galvanized Steel Gutters? Not all gutters are created equal. The recent popularity of galvanized steel, half round gutters is due to several different factors. The incredible durability and strength of heavy gauge galvanized steel gutters is hard to beat. They also perform beautifully in some of the harshest environments. MN homes need to have gutter systems that can handle the weight of winter ice without bending, warping or falling. Galvanized steel, half-round gutters from Minnesota Leafless Gutters delivers on performance and value year after year. Choose from a nice selection of colors that will complement your home beautifully. Minnesota Leafless Gutters provides a custom fit gutter system that is designed to last. In our business we see many different varieties of rain gutters that fail to provide the protection that home owners want and deserve from their rain gutter systems. This is why we choose only high quality materials that can handle all that mother nature sends our way. Precise installation techniques ensure that our seamless gutters will be sturdy and elegant for many, many years. The beauty of seamless half-round gutters from Minnesota Leafless Gutters can be seen in the elegant clean lines that grace your home. The semi-circle shape also provides practical benefits that add to the value. Here are some of the many benefits of installing traditional half-round gutters that you may not have already known. Minnesota Leafless Gutters has been around for many years because we provide excellent service, products and value for less. You can trust your home to a seamless gutter system installation contractor with years of experience and positive reviews. Ask about an estimate on high performance, elegant, affordable half-round gutters in highly super strong steel materials for your home.